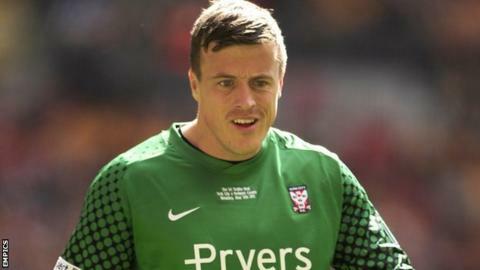 York City goalkeeper Michael Ingham believes he is deserving of a place in the Northern Ireland squad. The 32-year-old kept his first clean sheet of the season in his side's 1-0 win over Rotherham in the Johnstone's Paint Trophy on Tuesday. The three-times capped keeper told BBC Radio York: "I've said my piece on the subject, I think I deserve a call up. "I'm not saying I should be first or even second choice but I should be in that squad." His last cap for his country came under Lawrie Sanchez in a friendly against Wales in 2007. The three goalkeepers in the Northern Ireland squad are Nottingham Forest's Lee Camp, Olympiakos custodian Roy Carroll and Alan Mannus of St Johnstone. City manager Gary Mills told The Press: "I'm surprised he's not making the Northern Ireland squad. "I've told them about him and I don't think he can do any more but I will be making more calls to them now and showing them the DVD of last night's match because he deserves it." Former Wrexham goalkeeper Ingham also criticised his country's decision to overlook Minstermen midfielder Patrick McLaughlin in favour of Sammy Clingan, who is currently without a team. "It's ridiculous, Sammy hasn't even got a squad and Paddy's playing week in, week out and playing very well," he added. "I don't understand why a small country like ours isn't sending scouts to watch our games. I'm not being arrogant, we can do a job for them." Northern Ireland travel to Russia for their first World Cup 2014 qualifying match on Friday before hosting Luxembourg on Tuesday.